You don't have to be a statistician at the Census Department or a researcher at the Centers for Disease Control and Prevention to need statistical or data analysis software. Once used primarily for scientific research, the functions offered in these packages have now permeated the business and government arenas, providing what is called business intelligence. So while it will always be used for things such as tracking epidemics and mapping demographics, data analysis software is also applied to such tasks as controlling inventory, keeping track of purchase orders, estimating labor costs and anticipating user demands. The oldest statistical packages come from SPSS Inc. and SAS Institute Inc. Both companies' early products ran on mainframes and were used primarily at universities and governmental research organizations. 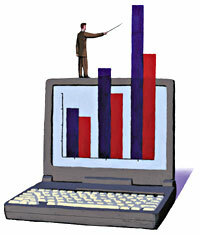 Their products, such as SPSS for Windows and SAS' StatView, are still the mainstays of professional statisticians. these products have a relatively steep learning curve and are fairly expensive, but they can be used in a very wide range of applications such as survey research, process improvement and process analysis. Casual users probably won't find the standard SPSS or StatView products inviting. But both companies have recently released features aimed at nonstatistician; so the required level of sophistication for users is dropping. For example, version 3.0 of SAS' Enterprise Miner provides a graphical user interface for the front end of its SEMMA'sample, explore, modify, model, assess'process. Users access all the statistical and data preparations tools, such as clustering, decision trees, variable transformations and random sampling, through point-and-click actions. And the recently released Version 10 of SPSS for Windows adds a direct Microsoft Excel interface and a new table-to-graph feature that automatically converts tabular data into visual graphs for easier analysis. Although some nonstatisticians can be taught to use statistical analysis packages, most organizations that need large-scale business intelligence capability turn to online analytical processing products. The applications aim to provide users a means of creating views of multiple relationships in large quantities of summarized data. The multidimensional analysis, along with the easy reporting tools, are the two defining features of OLAP, which otherwise is a somewhat vague category that includes many different types of applications. With OLAP applications, users can examine performance data and do comparison and trend analyses. The applications can be used for such things as analyzing the effectiveness of a consumer information program, financial reporting, quality tracking and manpower needs assessments. For example, you can track actual expenses against a budget or track income over time. You can view departments that are spending beyond their total annual budgets ranked by net differences, or view a list of the top five departments whose spending rates are below budget. Originally, all OLAP programs had proprietary client software. Now, virtually all of them also have an Excel add-in as a client; if you're already spreadsheet-literate, you probably won't need much additional training. Ironically, Microsoft has dropped the ball on the Excel interface in its SQL Server 7.0, according to Nigel Pendse, editor of The OLAP Report. 'It has produced possibly the weakest OLAP extension to Excel in the whole market, despite having a very good server,' Pendse said. OLAP@Work, from OLAP@Work Inc., a third-party Excel add-in maker, fills that gap (see story, Page 23). Excel add-ins make OLAP easier for end users, but the server products are relatively expensive and difficult to set up, and almost always require information technology involvement. If your data analysis require are modest, you may be able to use a relatively inexpensive desktop PC product. In fact, you may not have to buy anything. For light duty data analysis, Excel itself might fit the bill. Its new PivotTable views wizard helps you analyze your numbers from different perspectives. And to get different views of your data, you just drag and drop dimension headings from axis to axis. A step up in functionality from Excel is QlikView from QlikTech Inc. This is more complex to set up than PivotTable, so it's a good thing agency applications typically are set up by the members of the IT department or by other sophisticated users. But once the application is set up, the learning curve for end users is close to Excel's. A typical query using a desktop PC consists of small windows that display values stored in database tables. For example, in a budgetary application you might list department names in one window, regions in a second window and expenditures'such as office expenses, personnel and capital'in a third. If you want to know expenditures for personnel in a particular region for the previous six months, you just highlight the appropriate items in the windows. Excel, QlikView and other similar products are relatively easy to use, but they do require some sophistication to set up because they can do so much. If you have specific statistical analysis requirements, you may be able to find products aimed directly at your needs. One of them, CB Predictor from Decisioneering Inc., is aimed at prediction. It uses wizards to guide you through the analytical steps required to solve time series analysis and regression. Time series analysis predicts the next element of a series that is arranged as a time sequence. ''it can be used to analyze and predict traffic flows and growth. Regression is used to estimate the value of one variable when other related variables are known. For example, it might show changes in productivity given different personnel levels. Another type of specialty analysis product focuses on human resources. PeopleSoft Inc. provides a work force analysis product that works with its human resource management application, PeopleSoft HRMS. PeopleSoft Enterprise Performance Management, Workforce Analytics Version 8.0 extracts data from HRMS to provide analysis of such things as compensation, retention rates and headcount. It also allows users to analyze performance indicators and benchmarks to help agencies evaluate, for example, how compensation or a specific benefits program affects retention. If your database does not have a data extractor option, or if you want to extract data from a system to use in a data analysis package such as Excel, you might consider Monarch Data Pump from Datawatch Corp.
Products from SPSS and SAS are generally for professional statisticians or for sophisticated nonstatisticians. Don't get in over your head. Online analytical processing programs are fairly expensive and setup probably will require help from someone from the information technology department. Most OLAP systems have Microsoft Excel add-ins as clients. Casual users may find sufficient statistical power in Excel or other small-scale statistical packages. Some products are aimed at specific applications, such as analyzing human resource data, so you might find a product tailored to your needs. Traditionally, organizations provide users data in the form of ASCII reports that are issued weekly, monthly or quarterly. Data Pump lets users extract data for analysis from these routinely generated reports. It allows you to identify the fields, apply filters to rid reports of unnecessary data, create derived fields that have been calculated based on filtration, and create summary fields made up of calculations applied to other fields. Disparaging jokes about bean counters not withstanding, controlling and improving operations requires data and statistical analysis. For professionals, powerful packets that used to require mainframe strength can now be used on systems running Microsoft Windows. And for nonmathematicians, there are many products that skillfully hide the analytic operations behind easy-to-use drag-and-drop buttons, menus and toolbars.